SCRABIES - "Bug Bite Blues"
MACROFORM: in its macroscopic life stage, the Scrabies is an ambush predator, typically hiding among dense foliage or leaf litter where it retracts its body into an innocuous, globular pod. Once prey draws within reach, it springs to its full length, digs its hooked claws into any exposed tissue and siphons bodily fluids until the victim is little more than crumpled skin and bone. Once bloated to near immobility by multiple feedings, the Scrabies begins to desiccate, converting its interior tissues into its microbial phase and releasing a visible carbon dioxide fog; an attractant to many sanguivorous organisms. MICROFORM: in microbial form, a Scrabies is the only Fectoid capable of entomopathic transmission, thriving in the digestive tracts of such common ectoparasites as fleas, mosquitoes, ticks or bloodmoths. Controlling these tiny, stealthy carriers with ease, it injects itself into a primary host often totally unnoticed, initiating an infection marked by a full body rash of painful, itchy red welts, an uncontrollable terror of small arthropods and persistent, escalating delusions of their presence. REPRODUCTION:At the peak of a Scrabies outbreak, every living host will develop a single young macroform within a large, painful blister in their flesh. Emergence is not usually fatal in itself, but the young Fectoid will typically turn on its host for its first meal. PERSONALITY: a Scrabies despises extended, direct combat, always preferring to hide somewhere and lie in wait. 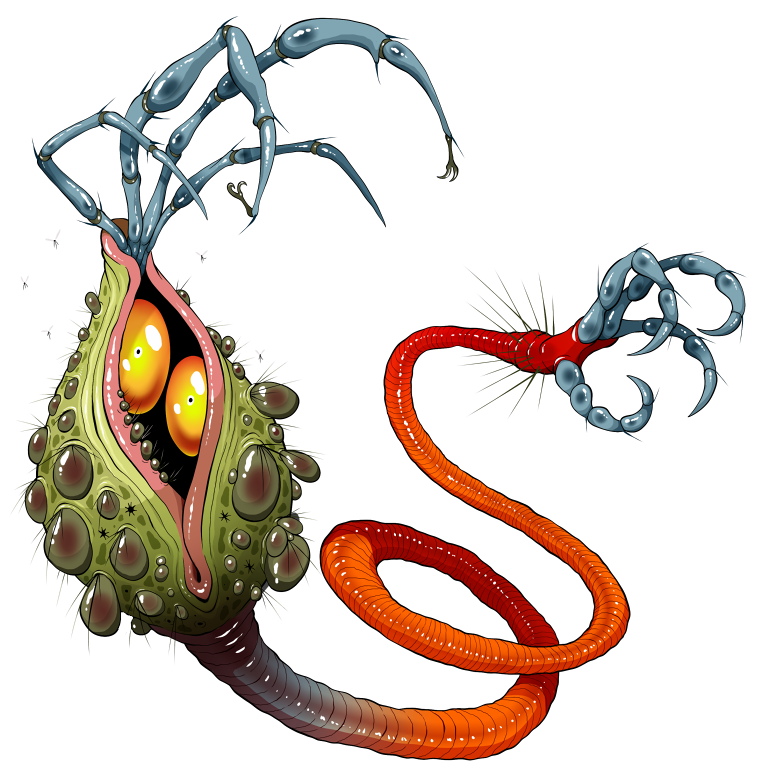 It typically boasts extensive knowledge of blood-feeding arthropoda and passionate opinions on its favorite carrier species, sometimes engaging in disastrous disputes with others of its kind over just whose choice is the superior infection agent.